日子能怎麼過? 就這樣吧... 1) Baking - Mostly cakes and breads, other items on occasion. 不能吃太多, 但似乎為時晚矣... 2) Painting - Preferrably portraits and abstract. 做個畫家可是小時候的夢想呢! 3) Trading - Trying to trade for a living, but finding it very difficult. 以為能夠依此維生, 太難了! 4) Praying - Talks with Lord JC, plus other related issues. 如果沒有祂, 這些日子怎麼熬得過來... 5) Playing - Everything else, especially work. 非因我是工作狂而把它當玩耍, 而是不以玩耍心態可做不下去... 當然, 和家人朋友一起的時光就真是玩耍了, 光想就開心! This is the first event cake order I received from the Crowne Plaza L. A. Harbor Hotel in San Pedro, California. The event is about a non-profit organization, New Beginnings Mai Am, whose ministry involves sponsoring an orphanage in Vietnam, as well as sending out medical volunteers to the same rural area. The organization was going to have a fundraising event at the Crowne Plaza L. A. Harbor Hotel on December 11, 2010, and the hotel GM, Mr. David Lai, introduced me to meet the President/Director of the organization, Dr. Mike Lehoang, for a chance to present my new cake career. Since this is a fundraiser, and it's for the orphans, I then volunteered to make a cake for this event, but Dr. Lehoang was just so kind and was generous enough to purchase the cake from someone who doesn't seem very much a real baker like me. The flavor of the cake is vanilla chiffon with taro root mousse filling and whipped cream frosting. I chose the flavor since this is an Asian event, and so far I have not come across any Asian who does not like taro root. LOL! Anyway, after numerous trials and errors testing the kitchen and ingredients, I finally made the cakes in three afternoons! Yay! Although the number of guests called for was 300, I actually made more than enough to feed 400! Most importantly, people enjoyed the cakes, some even had mroe than one serving. Mrs. Sue Lehoang was so kind to introduce me to her friends, and to pass out my fresh off the printer, home-made business cards! The mayor of City of Rosemead, Mr. Steven Ly, sitting at the next table also liked it very much, and right away invited me to make the cakes for his 200 people party next spring! Oh, how exciting is that! 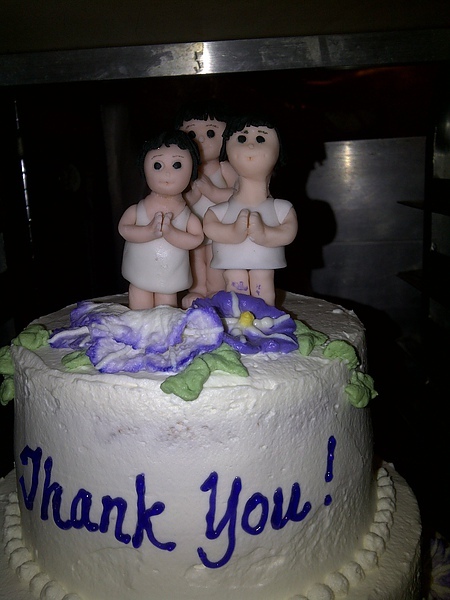 It is truly rewarding to see people enjoy my production, in this case, my cakes! Thank you, friends! 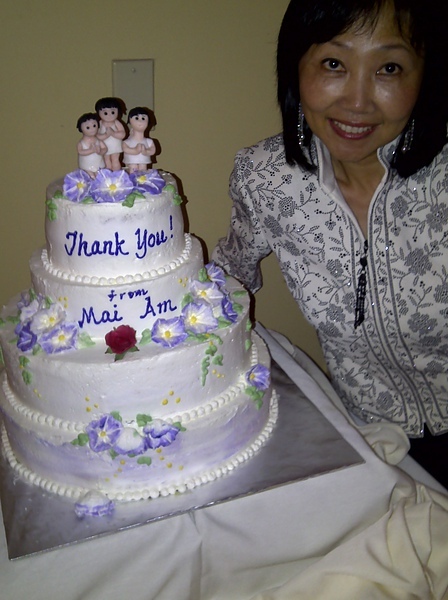 To Dr. and Mrs. Lehoang, for your order and kind referrals, and to Mr. David Lai, for the opportunities of cake making as well as for having faith on my cakes.